Photo: Little Hoops basketball competition. The first time they did it, 72 kids participated. The next year, 93 showed up. This year saw 153 local children! 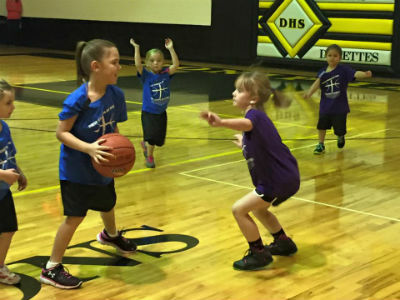 The Little Hoops basketball outreach of First Church of God in Doniphan, Missouri, has exceeded any and all expectations since that first bold attempt at something new a little more than three years ago. While sports ministries have certainly been around for a while, this is the story of a church that decided to do things a little differently. It should be no surprise then that this small-town church with a passion for reclaiming its community for Christ is winning both games and souls. Many churches utilize an effective nationwide program known as Upward. Upward has made it possible for churches to host incredible basketball ministries, but it’s not financially accessible for some. First Church of God faced that very dilemma. Photo: Going after the ball with all their might! It didn’t hurt that the head basketball coaches for the boys’ and girls’ teams at the local school were members of First Church. The campus of the church already featured a family life center equipped with a regulation-size basketball court but, as is the case with many churches across the country, these resources weren’t being fully utilized. The Little Hoops season is from December through January. Monday evenings and Tuesday evenings in December were set aside this season for the children in the program to learn the fundamentals and improve basic skills. On Saturdays in January, teams went head-to-head in competition. Everybody plays, regardless of skill level. Players wear color-coded wristbands to indicate relative skill level and are matched up appropriately on defense. Sixteen coaches, including several assistants, are assigned to each team. Not every coach is experienced in basketball, but each offers necessary adult supervision and encouragement. Those with basketball backgrounds do the bulk of the technical instruction, but all of the leaders have the opportunity to witness for Christ. Students and adults memorize Scripture each week, testimonies are shared, and Christian songs are often sung at half-time. Prayer partners were assigned from the church to each team; each student was prayed for daily, by name. When the basketball season concluded, these secret prayer partners were revealed and led their assigned teams in a poignant moment of group prayer. 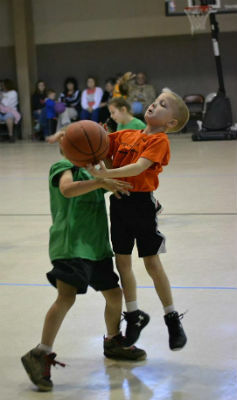 Jesus, not basketball, is clearly the subject of the Little Hoops program. Photo: Little Hoops invests in the lives of children. Up to five hundred people—parents, grandparents, siblings, cousins, and friends of the “star athletes”—crowded into the local middle school gymnasium on Saturdays in January after it was evident the games would attract more than the church’s family life center would hold. It’s important to the church that each child is introduced and honored individually, much to the delight of families. 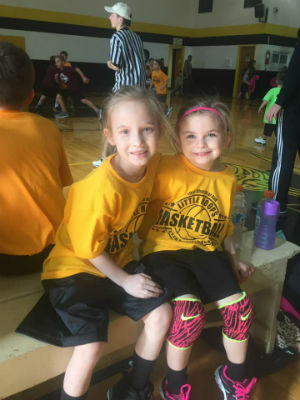 As a family-oriented outreach, Little Hoops only further strengthens the church’s rapport with the families in the community they’re trying to reach for Christ. The same can be said about the church’s adult softball and volleyball ministries. Your church may not be equipped with a family life center. Your local school’s basketball coach might not attend your church. Perhaps your congregation isn’t into sports at all. But sports wasn’t the point for First Church of God. Finding something the people already do and meeting a need in the community was the real goal. Utilizing resources already available to them, and not reinventing the wheel, was the strategy. It took effort, it took time, and it took intentionality. But they realized early on that all of us are God’s masterpiece, created to do the things he planned for us long ago. For First Church of God, Little Hoops was a slam dunk. And now the ball’s in your court. In Doniphan, Missouri, across the United States, and around the world, God is on the move in the Church of God. Join the movement. Donate today at http://www.jesusisthesubject.org/join-movement/. This entry was posted in All Church of God, Central and tagged basketball, Be Bold, community, Doniphan, family, First Church of God, gym, Larry Earl, Little Hoops, local, Missouri, neighborhood, outreach, reclaim your neighborhood, sports ministry, Upward. Bookmark the permalink.